Shirts With Random Triangles: Your Facebook fail of the day. This following was listed in the "Trending" section on my Facebook newsfeed today. 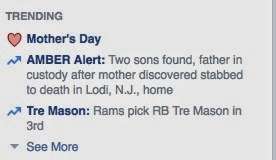 It's probably unintentional, but the juxtaposition of "Mother's Day" and a man killing the mother of his kids is still a little unsettling. Not to mention a more than a little awkward.